How about a new dog park? The Seattle Parks Department will build the newest Dog Off Leash Area (OLA) in Magnolia Manor Park at 3500 28th Avenue West, on Magnolia. Its tentative opening is spring 2012. YOU will determine how big it is. Big enough? What Parks has budgeted now: a simple 16,000 square foot OLA-about the size of our smallest dog parks. (Regrade at 3rd & Bell or Plymouth Pillars on Capitol Hill). Funding for this was approved in the 2008 Parks and Green Spaces levy. But Magnolia wanted more, and bigger. What’s been approved: 21,000 square feet, with a planting buffer and room for a small/shy area and a chuck-it zone. The public and Parks have approved it — Pending funding. Friends of Magnolia Manor Park (FMMP) and Citizens for Off Leash Areas (COLA), through our generous donors, have raised almost 30% of our goal for the OLA. Special thanks go to VCA/Magnolia Animal Hospital, which has stepped up as an ALPHA DOG sponsor! Donations are coming in, but we need YOUR participation to make it happen! Only $35 from each licensed-dog owner on Magnolia will build this park!! Parks will decide after March 1, 2012 how much OLA they can build with the amount available. Are you in? A new dog park on Magnolia? $35. Never again having to pay an off leash ticket (or drive 45 minutes to walk the dog)? Priceless! Go to www.coladog.org/mmpMatch to donate and make a difference! P-Patch Planning Meeting this Thursday! What would you like the P-Patch at Magnolia Manor Park to look like? Come help plan the garden! We are holding a Planning meeting on Thursday, Feb. 9, 7-9 pm at the Q Café, 3223 15th Ave W. See directions below. Site Workshop staff and Laura Raymond from the P-Patch Office will be at the meeting to gather your suggestions, answer questions, and go over various planning components. 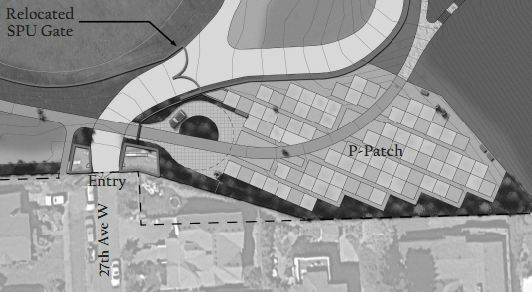 Previous meetings have been held to plan the entire park area but this meeting will be focused planning the P-Patch itself. We will also be focusing on broadening support for the garden and the opening up of all of Magnolia Manor Park for public use. Please come and let your voice and ideas be heard. Your time will count towards volunteer hours. By volunteering your time in planning and developing the garden you are working towards earning your plot assignment at the Magnolia Manor Park P-Patch. The total number of garden development volunteer hours is the principal basis for assigning plots. Volunteer hours can be earned through a variety of means such as physical labor, organizing, fundraising and administrative tasks for the garden development. The Q Café is on the west side (Interbay side) of 15th Ave W. , next to Quest Church. Street parking is free on 16th W just east of QFC and there is also a small parking lot next to Q Café. Like Us on Facebook (at upper right), and plan to come to our events and community meetings! Your volunteer hours help us make our community match for the grant AND can go toward earning a P-Patch!